After a series of kitchen disasters, during which several new dishes went straight into the bin, I tend to cook and bake things that are well known to me and disaster-proof. Like granola. Apart from the fact that it is still my favorite breakfast, it just feels good to pull something out of the oven that's edible. 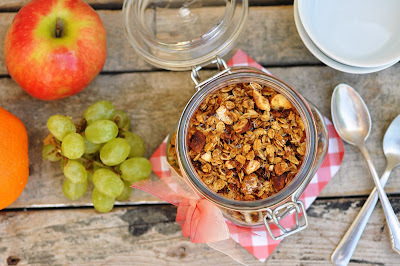 This orange cinnamon granola is in fact not too sweet. It only contains a few tablespoon of sweetener. I used date syrup (check this recipe to make your own). The flavors of orange and cinnamon dominate without being overpowering. It's further made with olive oil instead of vegetable oil. And that's all there is.